This is a continuation of an earlier post on roads being used as solar dryers. Our trip across Tarlac brought us to more of these facilities being used for agricultural purposes. The following photos are from San Jose and Mayantoc towns, which are obviously predominantly agricultural. The photos show lands devoted to agricultural as far as the eye could see and most are planted with rice. A friend commented that something should be done to reduce if not eliminate such practices along roads. I replied that this is basically the responsibility of local government units including barangay officials who should be educated about the dangers posed to travellers as well as the deterioration in the quality of the rice as it gets compromised from the waste and grinding they get from vehicles. In terms of practicality and recognising the limitation in funds for solar dryers, roads seem to be the easier and versatile option. Basketball courts and other concreted spaces scattered around the countryside do not make sense where roads would have more use especially to address accessibility issues (e.g., farm to market roads). Another friend commented on the earlier post that he almost had a collision with another motorcycle rider as the entire road was covered with rice being dried by farmers. I reasoned out that for rural roads with very low traffic, a single lane covered with rice could be tolerable but using the entire road width just is not right. Motorcycle can easily slip or skid along such rice-covered roads resulting in serious injuries if not fatalities. For most cases of what I’ve seen recently, the roads quality as having low traffic and rice is being dried only along one lane so we know at least that people are aware that one lane should at least be free of obstructions. 4 – That’s corn being dried just beside the pick-up truck in the photo. 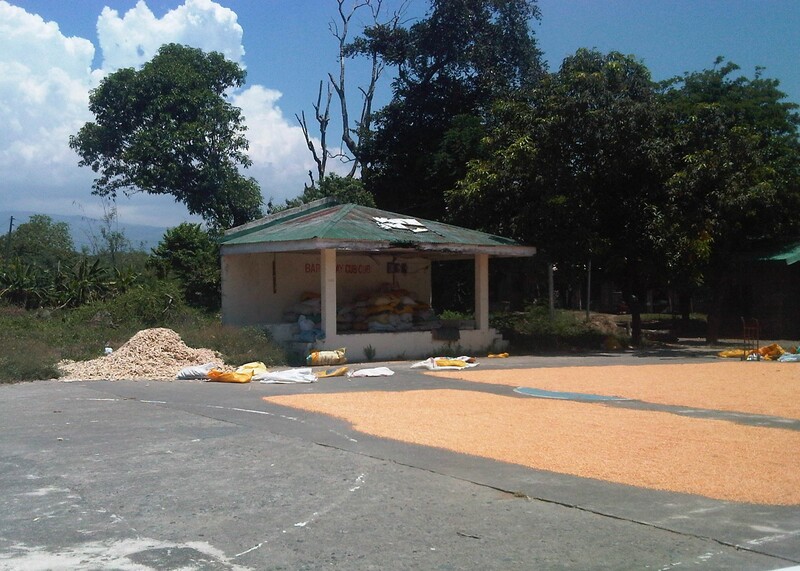 The last photo is of corn kernels being dried on a basketball court. You can see the cobs piled near the stage, which shelters what looks like sacks of corn. As I mentioned earlier, it is possible to have such basketball courts or social facilities to be used as solar dryers. Even schools grounds can be used for this purpose but only for weekends or during the summer breaks. However, it would be impractical to have basketball courts and plazas scattered all over the countryside just for this purpose especially in places where there aren’t much people in the first place. Roads still offer the more flexible use (i.e., access/FMR and solar dryer) as long as traffic is not significant. Perhaps where traffic is significant (i.e., significantly populated areas) then such “off-road” facilities should be constructed. But again, the responsibility for making sure roads are clear of agricultural products would fall unto the LGUs.